When I first visited London in the 90s I was staggered by the scale of it. Not so much physical size, but the mass of people. I remember being at Piccadilly Circus on a Sunday and there were just swarms of people, heading in all directions. I felt like a small town hick who had visited the city for the first time. 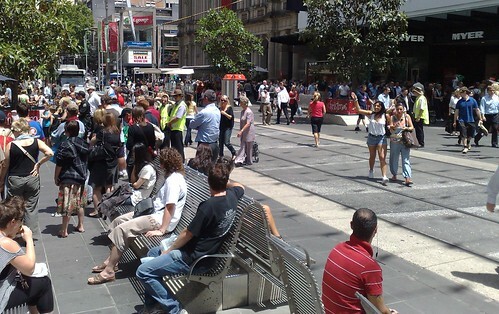 At the time, Melbourne didn’t have the same sense of “busy” that it does now. The CBD was pretty dead outside working hours, and until shopping hours were liberalised in the mid-90s, it virtually shut down at 1pm on Saturday, with no life again until Monday morning. That’s changed in the last ten years. The growth of the CBD’s residential population, together with the population growth in suburban Melbourne and the CBD’s 7-day-a-week shopping, eating, events and nightlife have brought it to life. As Melbourne’s built environment was transformed, so was its sense of self. Suburbanites again flocked into town for the football, or a show, or to eat and drink. Licensing laws were deregulated, transport, venues and parking were improved, quirks such as the city’s jumble of laneways were celebrated; precincts such as Lygon Street, the Queen Victoria Markets and St Kilda were tweaked. Students — local and visiting — became a fixture on the city’s streets. Apparently Melbourne is now the 89th biggest urban area by population, and if the predictions are right and we’ll be growing to 5 million in the next decade or two, it’s going to get busier. Projections show particular growth not just in 9 to 5 commuters, but in visitors — from overseas, interstate and in particular coming in from the suburbs. Melbourne’s becoming a big city. I reckon we are a great city, becoming even better. But I still can’t figure out why public transport patronage has skyrocketed much higher than the percentage change in Melbourne’s population. PS I loathe the expression “built environment”. Roger, you’re right. Melbourne is truly one of the greatest cities I have ever been to (and that’s a *lot* of cities, believe me). After decades (centuries, even) of people moving further out and us virtually inventing the term “suburbs”, Britons are also now flocking back to City Centres. The most noticeable manifestation of this has been the huge growth in apartments and inner-city living in cities like Birmingham, Manchester and Leeds. However, it is also manifest in the growth of more “practical” shops in the centre of our cities. In the 1990s you could buy a designer coat in town but would have struggles to buy milk or groceries. That’s definitely not the case any more. There was also a halt to the construction of more large out-of0town shopping centres, which brought several city centres back from the brink. By the way, I usually hate jargon (“negative impact”, “beacon status”, “rolling out”, “stakeholders”) but had never thought of the term “built environment” in this way. Presumably because this is because it’s a phrase I use a lot professionally (which is what jargon is, anyway. Suitably chastised, I’ll try to limit use of it in the future! Ian, yes, sounds like the same thing is happening in the UK as in Australia (or at least in Melbourne). I don’t have a problem with the term “built environment”. In my book jargon is okay if it’s clear what it’s talking about, and helps understanding. I notice that trend of building in the city in the Ottawa area as well. With in-fill of “Shop, Live, Work” being a slogan for many projects I’ve seen. Less of the suburbs growing outwards. 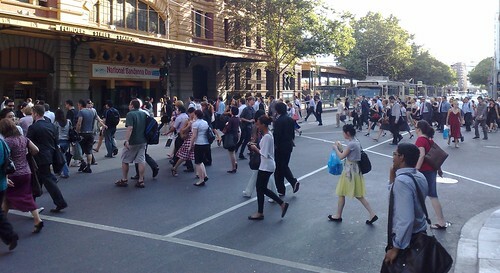 Yeah, Melbourne’s becoming a big city, but we ain’t building the infrastructure for it! Never mind the fact that our water supplies have dwindled over the last 10 years because of our state government’s refusal to build a dam, imagine when we get to 5 million! And by capping urban sprawl, as Bracks did, where will those people live? And think about what happens when you increase the population, but limit the number of houses- think houses are expensive now, wait a few years! All I can say is thank God we’re not Sydney- bad roads, tanking economy, empty football grounds! We live in the best city in the world, with an excellent road system, great culture, and excellent standard of life, great economic environment, but we risk losing it if we don’t keep our infrastructure up to date- yes, dare I say it, more dams, power plants, upgraded freeways, upgraded public transport system, increasing land for housing is what we need to be able to accomodate the 5 million we will have! Let Sydney go under, as it will, let Melbourne reign! The CBD was pretty dead outside working hours, and until shopping hours were liberalised in the mid-90s, it virtually shut down at 1pm on Saturday, with no life again until Monday morning. And most retail workers got to go to the football or races Saturday arvo and sleep in Sunday. The shops don’t sell any more than they used to, just have larger overheads and have killed off all the Milk Bars ect. I love Melbourne, I was born there (Mordialloc). My mum & dad are from Black Rock and Camberwell respectively. I love to visit, but I’m afraid I’m too countryfied now!!! Even though where I live here has around 100K regional population, I can’t stand extended stays in Melbourne – too busy, feels insecure, messy etc.